Comedy is probably one of the few genres we don’t often bother to review as it’s far too subjective for a fair review. Joe Dirt may be one of the dumbest things David Spade was involved with outside of letting Chris Farley die alone but, apparently, it had some sort of a cult following which earned it an illegitimate sequel years later. Still, we decided to do Big Stan. All because it’s our second movie pairing David Carradine and M Emmet Walsh. 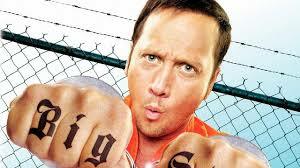 It’s a Rob Schneider movie and falls on its face harder than the Rob himself. He plays a sleazy land developer who gets sent to jail. Determined not to get assaulted, he decides to learn martial arts from Carradine. Tim says that, of the two parts that he laughed, one was Rob being punched for saying ‘that’s what she said’. Tim then gets to a request, Run the Tide. It star Taylor Lautner in yet another desperate attempt to keep his film career from petering out. It’s about as effective as a homeopathic cure and brings Lautner a step closer to doing bachelorette parties for the rich. He’s a high school dropout who’s taking care of his brother while mom is in prison. Tim at least has a lot to say about how much he dislikes it. Weltall then talks about First Man. The movie based on the first moon landing by the USA. It does decent job of conveying some of the lesser known aspects of the astronauts like their intelligence and that they’re adrenaline junkies. It’s very difficult to saying anything about a historical movie when they don’t drop a six ton weight on their balls.